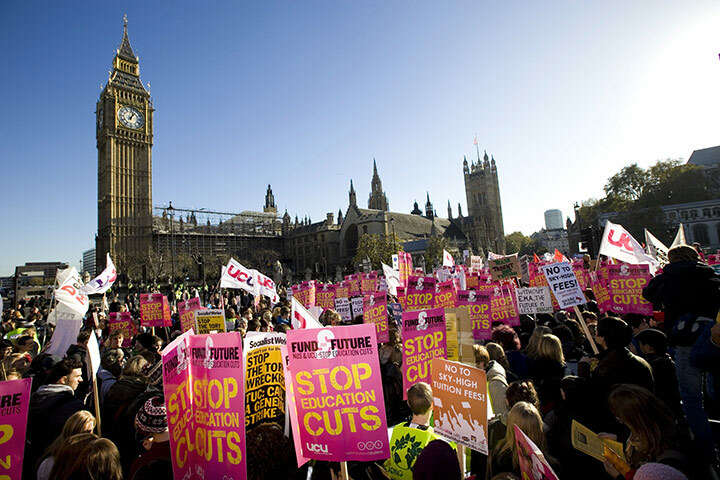 Plans have been put in place for a national demonstration for free education later this month. On November 19, thousands of students from all over the UK are expected to attend the protest in London. The march will assemble at Malet Street at around 12noon and march round Russell Square, down Kingsway to the Strand, and then to Trafalgar Square, Whitehall and ending at Parliament by 4pm. Dozens of campuses from UK universities- including Strathclyde, Glasgow Caledonian University and the University of the West of Scotland- are sending coaches, and the protest is predicted to be the largest of its kind since 2010. Hannah Sketchley, from the National Campaign Against Fees and Cuts, said that protestors “will be marching from the heart of the University of London – a symbolic site of protest over workers’ rights and the right to protest over the past year – to the centre of political power. Hattie Craig, from the National Campaign Against Fees and Cuts and Birmingham Defend Education, added: “This demonstration isn’t just about one day of protest – it’s about building a movement for free education. Posted in News and tagged demonstration, education, students. Bookmark the permalink.